Erdgeschoss Eigentumswohnung befindet sich zwischen einem spektakulären Blick auf das Meer auf der einen Seite, und ein 36-Loch-Golfplatz auf der anderen Seite. Moderne, up-up-date Eigentumswohnung (komplett renoviert im September 2017) mit einer voll ausgestatteten Küche, Unterhaltungselektronik und Deckenventilatoren in jedem Zimmer. Die Wohnung befindet sich in der wunderschön gestalteten Keauhou Kona Surf und Racquet Club mit vollem Zugang zu einem großen Swimmingpool, Tennisplätzen, alten hawaiianischen Ruinen, einem Gästepavillon, einem Volleyballplatz und mehreren Grillplätzen. Everything was as advertised: Clean, right on the ocean, ocean breezes and wave sounds at night, awesome sunsets on the lanai, boogie boards, snorkeling gear, beach towels, bath towels, shampoo, conditioner, body gel, and laundry and dishwasher soap provided, convenient to shopping and restaurants. In short, the unit included all we were looking for in our stay on Hawaii. Why only four stars? The unit directly upstairs was having remodeling work done, which meant we had to endure the sounds of demo day, along with drilling, pounding, power sawing, and other similar loud construction-related noises as the week went on. We realize this is not necessarily the owner's fault, but then again that's part of our vacation we will never get back. Owner sent easy to follow instructions on location and how to access the condo. Nice not having to deal with a front desk, just like having a private home. We arrived to find that we even had a reserved parking spot. The grounds of the complex are nicely maintained. When you see how close it is to the ocean there is that “wow” factor. We have stayed at a number of different condos in the past. We found this condo to be well maintained, exceptionally clean and roomy. The interior is tastefully done, not cluttered like so many beach homes. 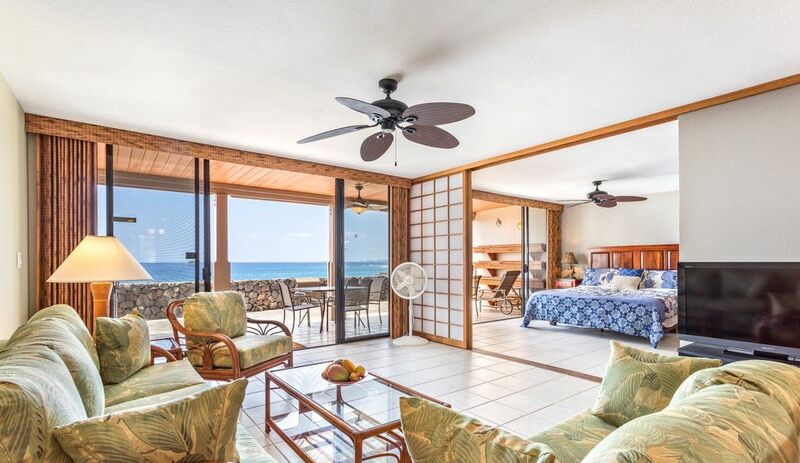 As stated in previous reviews, this condo is well stocked, you don’t have to run out and buy things like beach towels and a cooler to explore the island. We traveled from snow to the Hawaiian weather. There was hesitation to reserve a place with no air conditioning. The week we stayed, there was always air flowing through the condo, it was always comfortable. In fact, on some mornings it was even on the cool side. Having stayed on the other islands many times, we decided to see what the Big Island was like. We wanted to be near the Kona area but not too close due to the spring break crowds. The location of this condo worked out perfectly. The complex looked full during spring break, but this condo located in the last building was very quiet. We had a wonderful week staying on the Big Island of Hawaii at this condo. This is a very nice place with gorgeous views. Centrally located for groceries, shopping and dining. I would recommend this unit if you want enjoy your stay in style. Thank you for the use of your lovely town house for our visit to Kona, we were surprised and grateful for the gift basket of fruit and coffee! 👌😀. We were initially concerned about the condo not having air conditioning, but that was not an issue at all! We were also not expecting there to be some food, condiments, spices, cleaning supplies and things in the cupboards &amp; medicine cabinets... that was a very nice added touch. It’s Oceanside location and unobstructed veiw proved to be beyond our expectations! It’s location in regards to town centre was excellent! Thank you once again, we will highly recommend this to our family and friends! We had a great time! Appreciated all the condiments and spices, toiletries etc. The condo was spacious and clean and VERY quiet being the end unit. We would recommend though a more comfortable sleeper sofa as my girls slept on it and was pretty uncomfortable but being teenagers they suffered through it. Also, the dresser in the master bedroom is very hard to open- the drawers are squeaky and loud so maybe a different dresser. Thank you for an overall Great unit! Very nicely setup for 2 couples, one king bedroom and one queen bedroom each with their own bathroom. Kitchen was well equipped but a little skimpy on dishes and we cooked most breakfasts and dinners there. Grilling area is out by the parking lot. Quite a walk to the other end of the complex for tennis and pool. Ground floor unit so no stairs and beautiful crashing waves right off the patio. Very private since it is in the last building. Location is primo, we like this quieter location south of Kona. We enjoyed the fruit basket left from the owners organic farm and the tropical decor!